In the mid-eighteenth century, Swiss-born mathematician Leonhard Euler developed a formula so innovative and complex that it continues to inspire research, discussion, and even the occasional limerick. Dr. Euler's Fabulous Formula shares the fascinating story of this groundbreaking formula—long regarded as the gold standard for mathematical beauty—and shows why it still lies at the heart of complex number theory. In some ways a sequel to Nahin's An Imaginary Tale, this book examines the many applications of complex numbers alongside intriguing stories from the history of mathematics. 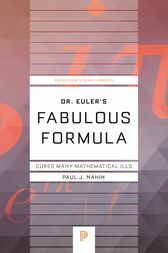 Dr. Euler's Fabulous Formula is accessible to any reader familiar with calculus and differential equations, and promises to inspire mathematicians for years to come. Paul J. Nahin is the author of many bestselling popular math books, including Mrs. Perkins's Electric Quilt, In Praise of Simple Physics, and An Imaginary Tale (all Princeton). He is professor emeritus of electrical engineering at the University of New Hampshire.